An intrinsic part of self leadership is that we take responsibility for our own happiness. Gratitude is so interlinked with happiness, that any one who wants to be happy, must learn to be thankful. The good news is that we can learn to be thankful. And we can get better at it through practice. Gratitude makes us happy, but we often forget to say thank you. In the midst of life’s challenges and difficulties it seems difficult to be thankful. But as I’ve often said, that’s when it’s most important. For gratitude is what will give us the strength to continue to look for the ‘lessons’ life is teaching us and the ‘messages’ that the Universe is sending us. Like every good thing, gratitude more than a feeling, is a discipline that we can incorporate into our lives. Having a gratitude practice like writing a gratitude journal, or spending 5 minutes each day in thoughtful thankfulness, or reciting prayers of gratitude at fixed times, can be most useful to make gratitude a habit. Saying thank you when we see a beautiful sight, have someone do something for us, or when we’re enjoying a moment make for good practice. Also learning to whisper thanks when we’re faced with discomfort – a traffic jam, a long wait in a queue, move us to a more radical approach to gratitude. As you might know, Vidya Sury and I have created a Gratitude Circle. 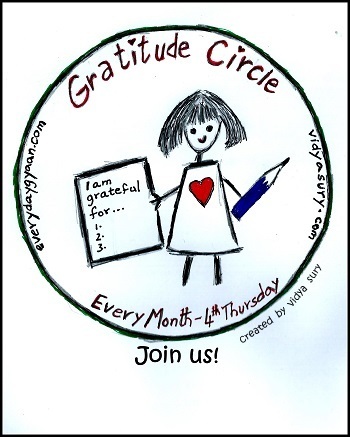 We invite bloggers to write at least once a month, recalling all they are grateful for and link it to our Gratitude Circle linky on the third Thursday of every month. Today is the third Thursday of April, so I’m adding the linky here and inviting you to link in with your gratitude posts. The linky will be open right up to next month. Today I’m on ‘T ‘ of the Blogging from A to Z April Challenge. My theme is the A to Z of Self Leadership. I’m also undertaking the NaBloPoMo for April – the theme is ‘grow’ and the Ultimate Blog Challenge. Inspiring corinne, agree with all that you wrote on giving thanks; gratitude is the memory of the heart and I am wanting and choosing to remain grateful all the time; thanks for sharing this post, I never get tired of reading your posts. I am celebrating my own gratitude by unplugging from the negative, Corinne! While I can’t stop the not-so-good and the losses, I can choose my response 🙂 And that’s what I am doing. I am looking at the happy bits and feeling grateful! That’s a great idea! To have a gratitude blog hop! I’m sure you’ll get lots of participants. You may also want to reach out to Shantayatales.com. Her blog has a similar theme. Thank you for all the posts that you have been tweeting. I really appreciate it and have been trying to find posts of yours to tweet on your timeline but it makes sense now to do it from your blog!